This is a different sort of Razer Phone 2 review because for the past month I've been using it as a standard everyday smartphone more so than a gaming platform. I've read a few books, made a lot of voice calls, ad I've watched decades old television shows in glorious SD and I've played a video game or two from about the same era. In other words, I've used the Razer Phone 2 as a non-gamer and with one predictable exception, it has delivered. (upbeat music) Just to get this out of the way, yes, I have used the phone for its main purpose and yes, it is an exceptional gaming device. I don't always notice the smoothness of the 120 hertz display in a game, but in the everyday swipes and taps of navigating Android, oh yes, this glides along as silkily as its predecessor. What I notice a lot more while gaming, is audio. I did get to try the Hammerhead ANC earbuds with this phone but the noise canceling isn't that great on these. Probably my favorite thing about them is they light up but that's kind of beside the point. If you use earbuds, you're missing out on these massive speakers and it's not just that they're big but they're positioned properly. See when I'm playing Alto's Odyssey on a OnePlus 6T, my palm frequently blocks the single bottom firing speaker and that's not a problem for these front firing blasters on the Razer Phone 2 and they're good for much more than games. I can't overstate how great the sound is on this thing. When I have it with me on the road and I wanna rock out in my hotel room, I don't need to use a Bluetooth speaker or headphones. It's pretty impressive that Razer managed this kind of sound while also making the speakers waterproof. You don't get something for nothing though, the cheese graders on those speakers are just as good at sucking up skin bits as on the first Razer Phone and if you're listening to a lot of podcasts, certain voices make the speakers rattle at full volume. As to be expected when you pack in over a hundred decibels into a phone, I find that keeping the volume set below 75 percent, solves for it. I do wish calls were louder on the speakerphone though. Other companies like Samsung use a custom dialer that gives you a toggle for more volume but because Razer does very little customization of the software, there's no such option here. That's a small price to pay for having such a clean Android experience though. 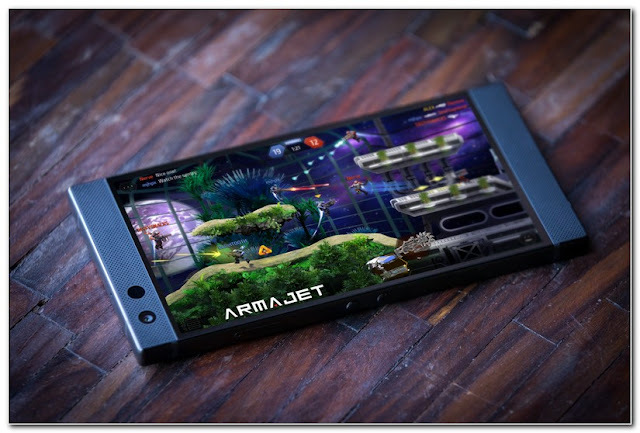 The only big changes beyond Nova Launcher are the Cortex app, that lets you customize how much power you want the phone to put into rendering each game, and the Chroma app, which controls the surprisingly addictive light-up Razer logo on the back. Now, if you've got battery anxiety, watch out, you'll sacrifice about three percent per hour if you keep the logo lit all the time. The phone's battery is brawny buy to buy, and if you leave it in the default settings with the screen at 90 hertz and conservative use of Chroma, you can expect many milliamps left at the end of the day. I never baby this thing and I seldom worry about going dead before midnight. When I do need to top up, the inbox wall plug does what a quick charge 4 adapter should, it gets the phone from empty to 50% in 30 minutes exactly. Thanks to the new glass back, wireless charging is also a thing and thanks to Chroma on the Razer charger, that thing is a lot of fun. It has Bluetooth so you can control the colors and brightness through the Chroma app now, it came in a recent update, it's not a reason to drop a 100 bucks on this thing, but the way the phone is built might be. See the charging coil is located way down low on this phone so using another charger is a crapshoot at best. Given those compromises, it's an open question as to whether the switch to a glass back was worth it, but if you wanna protect that glass back, lets talk about today's sponsor, dbrand. You know the drill, vinyl skins in almost any color or texture sold for a reasonable price and it really suits the phone nicely. I've had a dbrand skin on here since I got my review unit. Hit the link in the description for more. Now as I said in my first impressions video, I was happy to find that the Razer Phone 2's screen is much brighter than its dim predecessor but this is why extended testing is important. The moment I took is outside for a sunny day of playing Ingress Prime, I knew I still wanted more nits. Given how much brighter the direct competition is, that's the Asus ROG phone next to it here, this is still an area where Razer can and should improve. The biggest shortcoming of the first Razer Phone though was its camera, and that well, that's the lowest point of this phone too. Now Razer does deserve credit for upgrading the hardware with optical stabilization on the back and a selfie camera capable of 60 frames per second video. But that front footage is still stuck at 30 fps pending a software update as I make this video. And speaking of software, this still happens pretty regularly, not sure what's going on here. In terms of the photos themselves, well, I'll put it to you this way, I was shooting side by side with the much cheaper OnePlus 6T during my review process and on the whole, the OnePlus has it beat. Listen, that's not to say I always prefer OnePlus's photos. In fact, the Razer's tendency to go darker, sometimes serves it well. Notice how the 6T blows out the highlights on the white siding in these photos, while the Razer preserves it better. But try shooting your appetizer under dim lighting on Restaurant Week, you're gonna want a camera that can pull those details from the shadows. That gulf gets wider when you factor in OnePlus's Night Mode, which Razer doesn't have and the picture doesn't get any better when you consider that Google's Pixel 3, priced exactly the same as the Razer Phone 2, has the best fire and forget camera in a phone, in my opinion. But in truth, comparing this thing to a Pixel, really misses the point. Where the Pixel 3 is trying to be the Android phone for everyone, Razer built its Razer Phone 2 for Razer fans. It's almost like Razer's where Apple was years ago, selling a curated mix of features and aesthetic to a very loyal and very specific fan base. If that's you, or you're just lookin' for something different, this phone gives you a lot for the money. If that's not you, you'll likely find it harder to look past that mediocre camera or the older version of Android, particularly given how fierce the competition has gotten. The Razer Phone 2 is on sale now, both unlocked and at AT&T. Razer fans and oblivious others alike, I wanna hear your thoughts on this phone and I want you to share those thoughts in the first annual MrMobile Awards, hit up the link in the description to vote for this phone or anything else on the ballot in the Viewers' Choice section, and you'll also be entered for a chance to win a big prize. 0 Response to "Razer Phone 2: The Non-Gamer's Review "